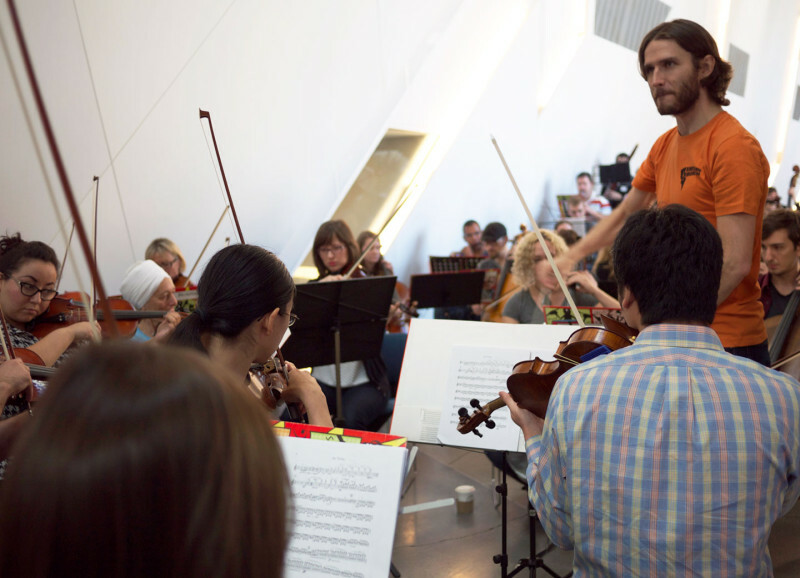 You don’t have to audition to play with Oakland's Awesome Orchestra Collective, but for its free monthly sessions, there are rules, or what they call commandments: Sign up; learn your part; show up; relax; be welcoming; have fun. And be excellent to each other. The orchestra is the brainchild of Berkeley's David Möschler. The 31-year-old conductor started the group in 2013, inspired by planning a surprise for a friend's ill father. The man was a doctor but had always dreamed of conducting. In 12 hours, Möschler managed to gather a 30-piece chamber orchestra. "Everybody was very moved, all the players," he remembers. "Everybody came up to me after, every single musician said, 'Dave we love playing in your theater shows, but this was awesome.' So, the seed was planted." Making classical music more accessible for both the players and the audience is one of the missions of the group. Unless it's participating in a ticketed performance, the orchestra's roving sessions are always free and open to the public. But these aren't typical classical music performances -- these are more like public rehearsals. “A lot of times when you’re experiencing art, you see the final product," says founding member and composer Brian Adam McCune. "You go to a concert, you see an orchestra, you see the culmination of weeks of rehearsal. Awesome Orchestra is an invitation to the creative process." Möschler wanted the orchestra to be adventurous with a high level of musicianship, so in addition to playing classics from the masters, it tackles everything from Bjork and The Lonely Island to music from "Star Wars" and "Lord of the Rings." According to Möschler, the group has seen over a thousand musicians in the last year and a half of sessions. Violinist Tessa DeCarlo brought her friend, viola player Kate Capra, to a recent session at San Francisco's Contemporary Jewish Museum. For DeCarlo, the session was a refreshing alternative to the normally high-pressure and competitive atmosphere of other classical ensembles. "I love it. It's very low key. They're playing very challenging music but in a kind of let's-get-together-and-jam way, which is really fun. Plus, you don't have to come to 30 rehearsals, you just come and play. It's also very exciting to be playing with a lot of young people; I'm an old person, and it's really exciting to look around and see piercings and tattoos and funny hairdos and so forth. So, I'm really enjoying that too." That sense of community is something Möschler feels is an integral part of making something like the Awesome Orchestra work. "We're actively trying to keep people inspired by making it a culture of encouragement and not about the politics of who's sitting in front of whom, how much they are going to get paid," says Möschler. "But when you get right down to it, people want to go on an adventure, and music is just a really great conduit for people to connect." 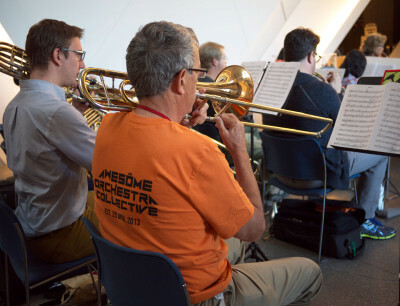 But the Awesome Orchestra also provides a space for members to debut original works and arrangements. In 2014, the orchestra backed singer-songwriter Matt Montgomery at the record release show for his EP, "Petty Troubles." And increasing exposure has led to collaborations with other musicians outside the group, including Van Dyke Parks. Parks, the celebrated Los Angeles songwriter, arranger and composer, has worked with everyone from Randy Newman and Harry Nilsson to Joanna Newsom and Skrillex. He famously collaborated with Brian Wilson on The Beach Boys album "Smile.” Parks has performed with the Awesome Orchestra twice, most recently at San Francisco's Z Space last year. He says he looks forward to working with the group again. “I go to a lot of the world to be with orchestras, and when we look at a group that goes from 'The Simpsons' to Shostakovich and Stravinsky, we know that the people are delivering the goods," Parks says. As for Möschler, he hopes the Awesome Orchestra can continue to grow. He says musicians from other parts of the state have already started to make special trips just to play with the group. "There are people in every city that would do this if they knew what it was like. Sometimes the concept is a little weird at first because we've been so ingrained about what it's like to play in an orchestra or to see an orchestra. But once they come and see one of our sessions, they understand. I would love to bring this to as many cities as could hold it, and for the group here to be the home base."